To Excel or not to Excel?! 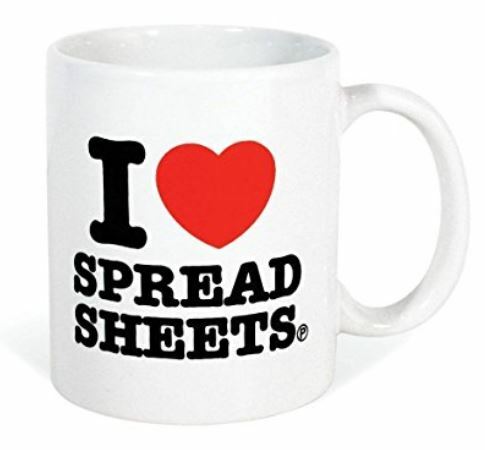 How sad is it that (i) I love nothing better than tapping away on a spreadsheet and (ii) I OWN that mug?!!! The spreadsheet’s enduring popularity hasn’t come without controversy: it has been under sustained PR assault for as long as I can recall. The criticism seems to stem from a reasonable source: the never-ending stream of spreadsheet errors which have caused all manner of calamity. The London Olympics famously sold 10,000 too many ticketsto the synchronised swimming events thanks to a single, mistaken keystroke. A combination of copy-paste mistakes and a faulty equation contributed to JP Morgan Chase’s $6bn trading loss in 2013. And most recently, Conviviality’s £5.2m “spreadsheet arithmetic error” was the bellwether for a nightmarish March, culminating in the business’s administration and acquisition by C&C. Interestingly, C&C has its own chequered past with spreadsheets: the Irish drinks business’s shares fell 15% after reporting an increase in sales when it had actually fallen. C&C’s group finance director explained the error resulted from data which was incorrectly transferred from an accounting system used for internal guidance to a spreadsheet. What to make of the spreadsheet, then? The comments on the Conviviality article by AccountingWEB members show opinion hasn’t changed: there are no bad spreadsheets, just bad practice. “I have been using spreadsheets since the early days of Lotus 1-2-3 and have learned to build in cross-checking methods into all my calculations,” wrote Agutter Accountants. “And quite frankly, something that is wrong simply looks wrong to experienced accountants. “As a management accountant by background I have always been a cautious forecaster. Understate potential income and anticipate all likely costs and generally speaking you stay out of trouble. AccountingWEB member Lytton Wolf’s offered a particularly grim example: “I joined a small manufacturing/assembly business a few months ago. I am still finding errors and unfathomable ‘logic’ in their management accounts spreadsheets. It’s not difficult to see how these errors occur. The European Spreadsheet Risks Interest Group (EuSpRIG) maintains a grisly catalogue of spreadsheet horror stories. But it’s not just about schadenfreude, EuSpRIG is attempting to alter the culture around spreadsheets. EuSpRIG’s website has a handy list of best practices to follow. But can’t all of this be fixed by abandoning the spreadsheet altogether? Arguably, you can fight the risks inherent to spreadsheets, or you could transition to a specialised forecasting solution. A tool like Excel also struggles with user friendliness. While a seasoned accountant can easily understand a spreadsheet, a non-financial stakeholder will struggle. “A budget only works if the people spending the money buy into the budget,” said Philips. The spreadsheet, he said, has become a victim of its own success. When the tool becomes overburdened – either by the number of users or the complexity of the business – it’s prone to breaking. And as non-financial people contribute to it, version control is cast aside. A forecasting solution is rigorous and specialised. Lacking Excel’s pliability perhaps, but avoiding the costly errors. But the flexibility is precisely why Excel is popular in the first place, said Nick Levine, the advisory lead at Propel by Deloitte. “What I’d say, in terms of flexibility if you want something completely bespoke, Excel is the number one tool. There are many software add-ons, they all promise a great future, but they’re limited in their functionality. “The specialised forecasting tools offer less chance of a human error and close to real-time data from the cloud accounting software. But they can’t provide anything as bespoke or focused as Excel. People have been predicting the death of the spreadsheet since the 90s, according to David Lyford-Smith, a technical manager at the ICAEW. “It’s been about to die for 25 years but spreadsheets are still great at doing lots of things,” he said. For Lyford-Smith, it’s clear that spreadsheets still have a place. The aim now is to instill good practice. And perhaps there’s too much focus on the tools, anyway. “Producing a good forecast is not about selecting the right tool, rather than the right methodology and data on which you will build your forecast,” said Hugh Johnson, an AccountingWEB contributor and vice president of Suntico, a financial data analysis platform provider. “If you understand the basis of a forecast, you can make your own judgements as to how you should use it”. This entry was posted in accountants, accounting, spreadsheets by clarelondon. Bookmark the permalink.